KUALA LUMPUR, 16 Nov 2015 — An all-new innovative product that is brewed with subtle spicy hints of clove, coriander, and orange peel becomes the latest addition to join Tiger’s expanding portfolio. Brand ambassadors at Tiger White press conference held at Black Box, Publika. Guinness Anchor Berhad managing director Hans Essaadi said: “In 2013, we reinterpreted a popular European-style drink with Tiger Radler, which has proven to be a popular choice that appeals to both beer and non-beer drinkers alike. Following the success of this variant, the time has come for us to provide our consumers with a new refreshing option; an option we’ve identified resonates well with them – wheat beer. Right now this drink of choice is mostly imported, making it an ideal market for us to tap into, and by brewing it locally, we refresh this wheat beer category as we increase its reach. 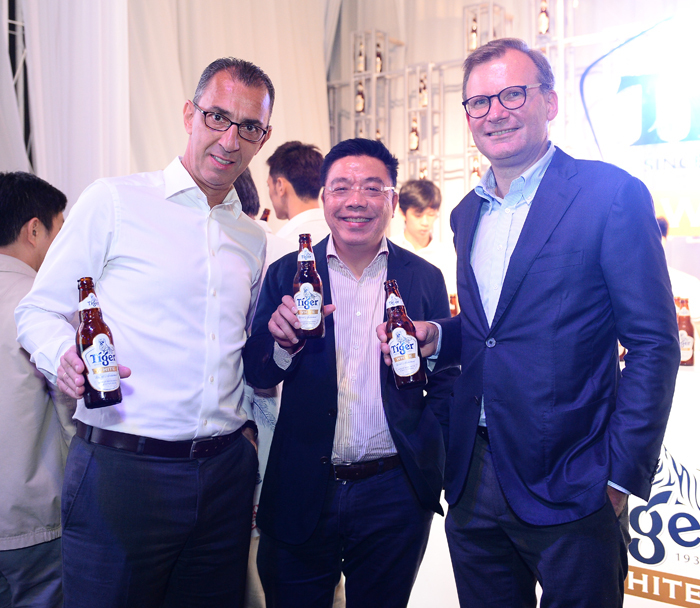 Guinness Anchor Berhad managing director Mr Hans Essaadi (left) with Heineken Asia Pacific’s president Mr Frans Eusman (right) and managing director Mr Kenneth Choo. GAB MD Mr Hans Essaadi (4th from left) , Heineken Asia Pacific Region president Mr Frans Eusman (4th from right), GAB’s sales director Mr Thum Chee Yuen (2nd from left), chairman Datuk Seri Saw Choo Boon (3rd from left), marketing director Mr Bruce Dallas (3rd from right) and Tiger Beer marketing manager Ms Jessie Chuah (2nd from right). Tiger White – Asia’s Wheat Beer debuts in the market here before anywhere else in the world. Tiger Beer marketing manager Ms Jessie Chuah on stage to talk about how Tiger White’s philosophy ‘It all starts with white’ inspired ‘Coaster’ – the first crowd-sourced movie production done entirely via physical and digital beer coasters. An Honest Mistake performing at Tiger White press conference held at Black Box, Publika.